Cheerleading fundraising does not have to be hard work. There are lots of great ideas out there. Give them a little tweak to suit your team. And away you go! There is nothing worse than having to be constantly raising funds. It can take up so much time. Time that could be better spent learning new routines, coming up with new cheerleading cheers and chants, and practising for competitions. However organising successful fundraisers does not have to be a drag. 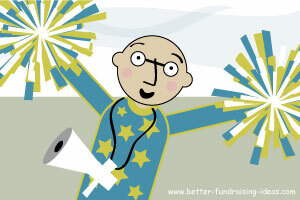 If the ideas are good enough lots of cheerleader fundraisers can actually be really good fun! They also are a great way to build team spirit. The other thing is that by undertaking fundraising activities in your local community you can make friends, attract sponsorship and build a big base of supporters who will then be behind you because you are "their team". Many ordinary fundraising ideas (and some not so ordinary) from this website can be used to raise money for your squad. The thing is to give them your own special twist. For instance how about a cheerleaders babyphoto competition or the cheerleaders healthy eating cookbook. Often just running ordinary fundraisers but wearing your cheerleading uniforms is enough to grab peoples attention and make things different. Just think outside the box a bit. Then get organised and GO FOR IT! And get people on side then who can? So put as much enthusiasm and dedication in to your fundraising as you do practising your routines. It really can be a lot of fun. If you come up with a great idea share it with other people on this site. The different ideas come from all around the world and its great to help other people by sharing your own tales of success. Cheerleading Videos - Raisng funds with your own films. Tombola -Run a Tombola stall at any local event. Abseiling - Take the fastest route down! Charity Bungee Jump - 1..2..3.. Bungeeeeeeeeee! Firewalking - Hot-step your way to fundraising sucess! Sponsored Parachute Jump -You did say you'd do anything to raise funds! Don't forget too that the local fete is also a great opportunity for cheerleading fundraising. Either organise your own Mini-Fete or run stalls at someone else's event. So you can see there is no shortage of great ideas for novel fundraisers. All they need is a little bit of that old cheerleader razzle dazzle!